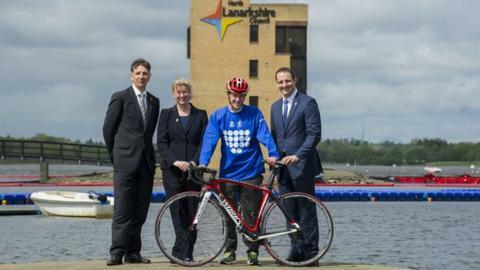 The Scottish Environment Protection Agency has said the water quality at Strathclyde Park loch will be safe for triathlon swimmers at Glasgow 2014. The agency has worked to address problems with bacterial contamination and the threat of toxic algae ahead of the Commonwealth Games event in July. North Lanarkshire Council has installed a floating barrier system to protect the swim area. Sepa's Calum McPhail said the water quality would be checked weekly. And the agency added the manmade loch is susceptible to bacterial contamination after very heavy rainfall because it is fed by "an urbanised river system" that takes water from drains, sewage, run-off from farmer's fields and the like. In addition, the Sepa, who are working in partnership with the council and Glasgow 2014, had identified a risk from high sunlight when "there could have been an algal bloom of potentially toxic cyanobacteria" that would have breached international triathlon water quality criteria. Mr McPhail, Sepa's environment quality manager, said lessons had been learned from organisers of the London 2012 Olympics, who had similar problems with water quality. And he explained Sepa was "very confident" that the system of barriers and safe chemical treatment meant that "both the bacterial contamination and the risk of a blue-green algal bloom are both very much under control". "A year ago we identified that one of the ways of breaking the potential pollution pathway was to build this multiple floating barrier system that protects a segregated swim area," Mr McPhail explained. "There is a spare set of barriers ready to be dropped so it's a double protection system. "The big risk factor has been after periods of very heavy rain when you know that the main part of the loch does have elevated levels of sewage and rural-derived faecal indicators, which are bacteria." He added: "We know that can still happen, but when we do testing on both parts of the loch, the inside part of the protected swim area has been very high quality so we know that the barrier is working. "We are all very confident now that we are looking forward to a high-quality sports event. "Results to date give us a considerable level of confidence and we are keeping a continual monitoring on a weekly basis all the way up to the Games on the 24 and 26 July."